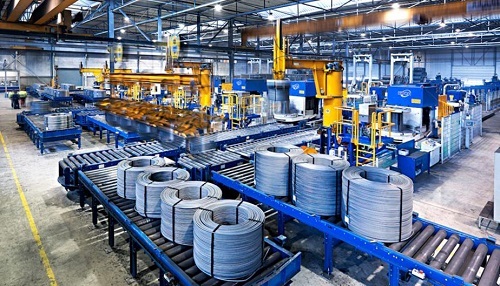 The automatic wire coil compacting and strapping line is a solution for substantial production demand. Well packed product is able to against all the possible erosion. High water proof and dust proof quality keeps your product away from water spots and dust or other substance which may affect the quality of your commodity. Both semi-automatic and full-automatic type can be provided. Specific design and plan will be made by our engineering team according to the data provided by the customers. From compacting to strapping to wrapping, our packing line will give a perfect package as you want. PET or steel belt, stretch film, PVC, our machine can apply to different types of packaging material. Special setting can be set by the users themselves, which reduces waste and improve efficiency dramatically. We are responsible for the whole equipment design, the equipment integrity, and the completeness& accuracy of all the documents. All of the design are based on Metric standard and comply with the existing ISO standards.All bearings are adopted according to International standards. 1) Solid structure, firm and durable. 3) Soft start and stop. 4) Compacting driven by hydraulic. 5) Special transmission mechanism adopted, safe and stable. 7) Multiple limit protection makes the machine more safe. 8) The machine stops automatically. 9) Obligating position for manually strapping. 10) Two way back pressure technical, ensure smooth transition during shifting of gravity. •Steel coils will be situated on specific holders and be delivered to the designed position for compressing. After compressing the coils will be strapped and then delivered by conveyor to next process. • According to customers’ demand, automatic wrapping can be added to the packing line. Sensors will be placed along the line for detecting the coils and sending signal to PLC to restart the programme. • The maximum capacity is one coil a time. • An automatic compactor will be situated on the top of rotation table. The mission of which is to press the wire coil before being strapped. The pressing process will be powered by hydraulic cylinder.The press has some supports that act directly against the wire coil at certain points to compact the coil. Some HDPE material will be carried to avoid damaging the material while compacting the coil. The compactor attached with a rotary system that is powered by an electric gear motor. The rotation of the compactor and the strapping table is performed simultaneously, a speed changer will be used to control the speed. • Automatic Strapping Machine is placed on the top of the compactor and strapping table for polyester strap. And at certain point this strapping machine will be supported and fixed. • The strap dispenser and accumulator will be placed on the strapping machine frame. The strap dispenser is designed for a 19mm polyester strap coil. • The strapping head has pneumatic, electric and mechanic elements. The strapping head has a strapping line to perform the strapping with 19mm polyester strap. • The strapping will be performed in the front part of the wire coil without any damage to the material. HDPE material will be chosen to make the contact zone of the strapping head. • At the compactor there is a button panel in order to perform operates it and the rotary table manually, in case is required to do from this position. • In order to perform maintenance works of the strapping head, the head should be situated at back position. The operator has to introduce a security bolt of the strapping head in the corresponding slot and all the, electric, pneumatic, hydraulic and mechanic movements of the strapping machine are cancelled. • A hydraulic group will be included in the offer to manage all the hydraulic movements of the offered elements.